The Great Gatsby (1925) by Francis Scott Fitzgerald could arguably be the great American novel often desired and debated among readers and writers. The Great Gatsby (1925) by Francis Scott Fitzgerald could arguably be the great American novel often desired and debated among readers and writers. This is the third time I have read the book (once in high school, another time in my twenties, and now in my thirties), and it will not be my last. Not only is the writing on a sentence level superb but the chapter structures which set up the characters and therefore the plot is exceptional and far beyond what is found in most literature in the days of sugar rushes and technological brain-fixes. Fitzgerald had a plan and followed it through brilliantly. Even the character that bears the eponymous title does not appear until chapter three, almost 1/4 through the book. A bold move by an expert hand. Chapter 1: Here we have the introduction to the narrator, Nick Carraway, who becomes a fly on the wall in most regards since he is from out of town, from the Middle West. He is, however, the one who holds the secrets and refuses to act in the end to either condemn or save his friends. In this chapter, the setting of West Egg, Nick’s cottage and Gatsby’s mansion is first briefly established, since it will be the primary central locale, most of the external and internal action revolving around Gatsby in the story. However this chapter belongs to East Egg and Daisy and Tom Buchanan and the intro to Jordan Baker. This chapter fully establishes the side of Old Money in America. “We were in the same senior society,” Nick tells us of Tom, “and while we were never intimate I always had the impression that he approved of me and wanted me to like him with some harsh, defiant wistfulness of his own” (pg. 7). “Her gray sun-strained eyes looked back at me with polite reciprocal curiosity out of a wan, charming, discontented face. It occurred to me now that I had seen her, or a picture of her, somewhere before. Chapter 2: Now the setting moves with Nick and Tom going into the drudges of society, where he describes it as as a wasteland and as Doctor T.J. Eckleburg watches over “this valley of ashes”(pg 23). This is the section for Poverty in America and represents Gatsby’s past as a poor, farm boy, and the chapter is cleverly placed between chapter one (Old Money) and chapter three (New Money). Furthermore, in this chapter, the characters of Myrtle and Catherine are introduced and the lover’s apartment in New York City will mirror the end of the novel where Gatsby and Tom have it out for Daisy at the Plaza on a hot afternoon. Chapter 3: The Trinity of America is fully established here when the section focuses on Gatsby’s parties and his mansion in West Egg (representing New Money, and situated exactly across the bay from Daisy, Old Money). The chapter even begins: “There was music from my neighbor’s house through the summer nights” and it calls forth the Bacchanalian spirit found in 1920s America, surging against those more traditional foundations of Old Money. As for Jay Gatsby, his legend is fully established by the third chapter as a mysterious war hero and/or murderer which Nick overhears at the party (gossip). Nick finally meets the grand host by page 47, and the story quickly unfolds. “The caterwauling horns had reached a crescendo and I turned away and cut across the lawn toward home. I glanced back once. A wafer of a moon was shining over Gatsby’s house, making the night fine as before, and surviving the laughter and the sound of his still glowing garden. A sudden emptiness seemed to flow now from the windows and the great doors, endowing with the complete isolation the figure of the host, who stood on the porch, his hand up in a formal gesture of farewell” (pg 55). We see that there is no way the author could have written this story as Gatsby in a first person point-of-view, like Dickens did with many of his eponymous works. Nick serves his device very well. Chapter 4: Since we have the Trinity set up (Old Money, Poverty, New Money) there is but one place to go, and that is to the past. The author/story-teller takes us to the origins of Gatsby through two methods: A) Gatsby invites Nick into town for lunch, and we get one side of the story (the legend); and Nick is told by Jordan about Gatsby from Daisy’s side (the truth). Nick sums it up best when he explains: “A phrase began to beat in my ears with a sort of heady excitement: ‘There are only the pursued, the pursuing, the busy, and the tired” (pg 79); and this fully describes our characters and their motivations. Tom (Old Money) is pursued by Myrtle (Poverty), who chases down the yellow car by mistake and is killed. 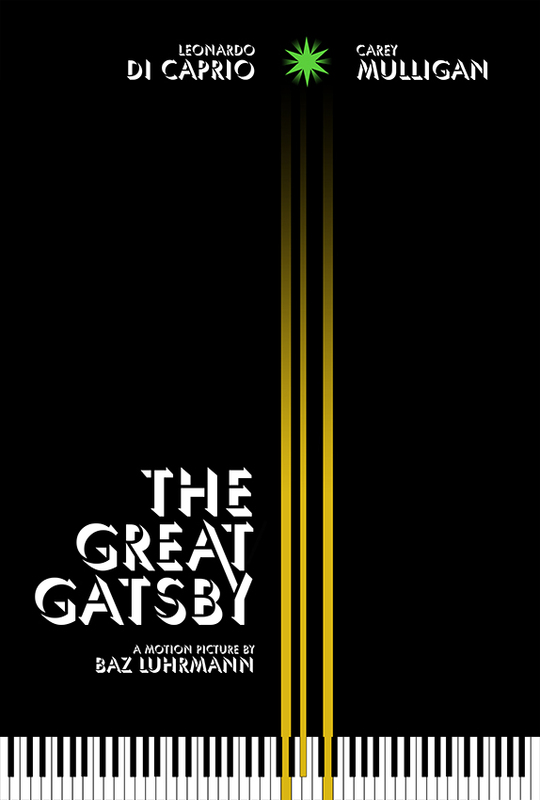 Daisy (Old Money) is pursued by Gatsby (Poverty and New Money), who is killed through Tom’s misdirection and malice. Therefore, Old Money wins out with Daisy and Tom going away, likely Europe, as Myrtle and Gatsby (representatives of Poverty and New Money) are written off. Chapter 5: Gatsby meets Daisy, Nick as guide, at the cottage and then the great mansion is explored. Chapter 6: A reporter arrives asking questions about Gatsby’s past and much of the truth begins to be revealed about Gatsby. Daisy and Tom are invited to one of Gatsby’s parties. “The he kissed her. At his lips’ touch she blossomed for him like a flower and the incarnation was complete” (pg 111). Chapter 7: (A big chapter that ignites the story and reaches the climax) Gatsby and Daisy become lovers. Then the confrontation on a hot afternoon in a suite in New York City, mirrored earlier in Ch. 2. That night, Myrtle is killed when Daisy hits her with Gatsby’s yellow car. Chapter 8: The death of Gatsby, both real and symbolic. “But he didn’t despise himself and it didn’t turn out as he had imagined. He had intended, probably, to take what he could and go- but now he found that he had committed himself to the following of a grail. He knew that Daisy was extraordinary, but he didn’t realize just how extraordinary a ‘nice’ girl could be. She vanished into her rich house, into her rich, full life, leaving Gatsby–nothing. He felt married to her, that was all” (pg 149). Chapter 9: Gatsby’s funeral which no one wants to attend, and a recap by narrator Nick Carraway. All done in 9 chapters and 180 pages. That’s how you write a great American novel. With vivid characters, settings that help shape the story, and a plot that embodies the American dream. Here we have Gatsby as a poor farm boy (Poverty) who rises to wealth and fame (New Money) as a bootlegger, pretends to be an Oxford man (Old Money), and believes in a great, innocent love with Daisy (True Love), who he is separated from during the Great War. Nick said it best about Gatsby: “They’re a rotten crowd… You’re worth the whole damn bunch put together” (154). The Great Gatsby is a must read and a strong recommend.